host family's son, Otman, and fellow Young Ambassador, Brad. It was May 4, 1994. 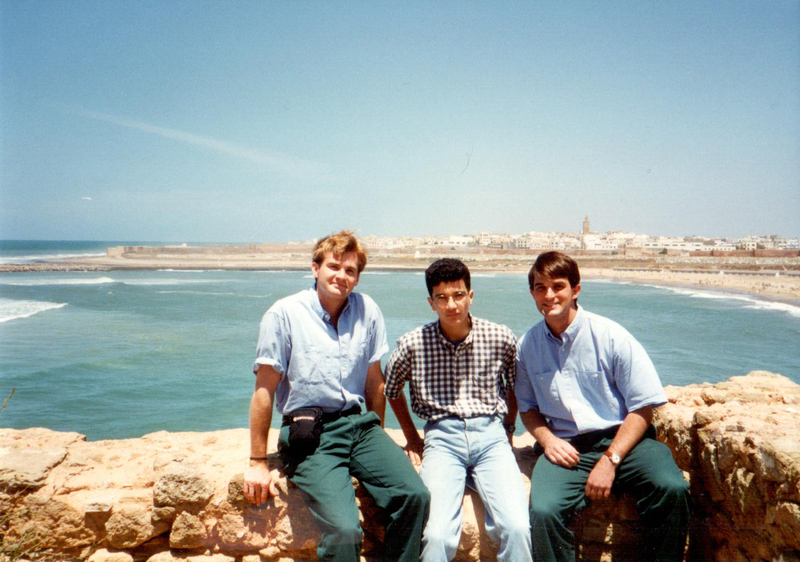 Me and a group of college buddies traveling with the BYU Young Ambassadors left our seaside hotel in Asilah, Morocco, and headed to the ocean to take advantage of some of the largest breaking waves any of us had ever seen. We were so excited to get into the water and do some body surfing. Once we got there I headed out to the ocean with the usual group. The beach was beautiful as the sun was setting. I went out and was body surfing but I got out too far. The waves were very strong and the undercurrent even stronger, and I ended up in lots of trouble. For a couple minutes, it seemed like, I was being pushed or pulled under water. I was so tired from lack of sleep that I was starting to lose strength. Luckily, Dave was out about two waves from me — neither of us could touch bottom — and he had a floaty board from the hotel. He had lost it in a wave and it came towards me. I had been hollering at Chris to help me, but he was too far away. I turned around to find David just as a wave brought the board by me and I was able to grab it and hold on to it. I wrapped the string around my wrist and got on it. I was still knocked off the board and under water twice. But I made it back, totally exhausted and scared. Looking back on that experience, I know it was no accident the boogie board was there and that it was directed to me so I could catch my breath and eventually make my way back to shore. I was swallowing so much water and having trouble staying on top of the waves that I thought I was going to drown. I remember thinking, "Heavenly Father, I'm really in trouble. If you don't want me to drown, I could really use some help here." The very next wave brought me the blue boogie board, which basically hit me in the head. Then the thought came to me, "You might lose hold of the board with the next wave. Better wrap that string around your wrist so you can stay connected." Some may say this experience was happenstance or luck. I believe it was an answer to prayer, followed by revelation. There was no doubt in my mind that I needed help to make it back to shore alive. I prayed for help and it arrived in the form of a borrowed blue foam kickboard. Then, like a light bulb turned on in my mind, I had the wise thought to secure the board to my body by wrapping the rope attached to it several times around my wrist. This small flotation device made it possible for me to stay on top of the water long enough to catch my breath and eventually rejoin my group. My life is peppered with noteworthy experiences like this — experiences where my knowledge of a loving, caring, responsive Heavenly Father has been reinforced bit by bit until my awareness, belief and knowledge of Heavenly Father has become sure, firm and unshakable. This doesn't mean life is easy, that there aren't challenges along the way. But it does mean I know from experience that I can always call upon support from an all-knowing, all-seeing Supreme Being who takes the time and makes the effort to be involved in my little life. I know my Heavenly Father lives and loves me perfectly. I love him too, albeit imperfectly, and look forward with faith and hope to a future reunion with Him and all my loved ones.